An Alabama native, Felicia grew up in a large, loving, middle-class family in Mobile and Baldwin County. She earned an academic and athletic scholarship to Spring Hill College where she played soccer and graduated with a BA in English. She also holds an MBA from Southern Methodist University (SMU) in Dallas. Felicia is a business executive with an award-winning career in sales, marketing, and management in the software, office equipment and medical device industries. Felicia is an active community volunteer, serving on a nonprofit board, at local hospitals and with children’s and education charities in Mobile, Birmingham, and Dallas. In 2017, she was a nominee for the United Way’s inaugural Ignite Awards celebrating passionate volunteers in the Birmingham area. She is a progressive, pragmatic, principled and positive leader who loves her home state and expects more from its leaders. Felicia and her wife, Christy, recently celebrated their 16-year anniversary. They have energetic twin daughters, Helen and Harper, who attend Mountain Brook Elementary. They are also in the Daisy patrol of Girl Scout Troop 350, which their moms help lead. The Stewarts are members of the congregation of Baptist Church of the Covenant in Birmingham. The family loves traveling (“going on adventures” – Helen), spending time outdoors (“when it’s not too hot” – Harper) and visiting friends and family across the south. I am a native of Alabama. And for many of us, this fact elicits a range of emotion. I am passionate about this place, the roots of the people I come from and the soul that emanates from our Southern culture. I value our abiding commitment to faith and to family and our deep-rooted pride of place. I also feel the sting of our troubled past, and frustration with our lack of meaningful growth and advancement. I am running for State Representative because I expect more from the state I love. I expect our elected officials to heed their calls to public service as servants and not as paid puppets. I expect our laws to equally protect and support all of the people of this great state. I expect a fair and level playing field so that each child can reach his or her God-given potential. I expect clean drinking water, clear air and natural resources for this generation and future generations to enjoy. I expect our legislators to ask more questions, review more data, measure more outcomes, engage with more citizens, and communicate with more transparency. I expect state leaders to behave and to govern with the highest level of ethics and integrity. 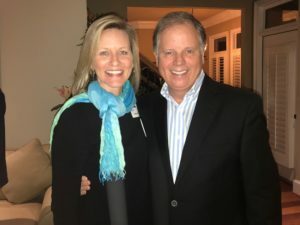 I expect our legislature to prioritize solutions to real problems facing Alabamians like job and wage growth, education, criminal justice reform, healthcare and environmental protection instead of spending valuable time debating non-existent problems like bathroom choice, how quickly we can kill a death-row inmate and what measures need to be in place to forever enshrine confederate monuments. These measures do not help heal our past or provide a meaningful path forward for our state. I expect our elected officials to heed their calls to public service as servants and not as paid puppets. I also expect more from myself. It’s not enough to just be aware or involved, I will be active and engaged in all facets of the process…I will do more…I will say more…I will lead and problem solve as I have done my entire life as an athlete, a student, a businesswoman, and a mom. If you share my expectations, then I ask for your support in all the ways that you are able. We gratefully accept your time, your voice, your social media support, your monetary contributions and most importantly, your vote. Together, our expectations will build a better Alabama for our children.